If you’re into the comedic genre of movies at all, than chances are you’ve seen The Hangover. If you live under a fairly big rock and have never heard of it, The Hangover follows a comedic trio who happen to lose a friend of theirs during a wild and drunken bachelor party the night before. If there’s ever been a movie that exemplifies the true spirit of the Las Vegas bachelor party, it is The Hangover. If you have seen the movie and think it looked like the perfect time, lucky you – websites like BachelorVegas.com can create an experience that could leave you recreating events from the movie. 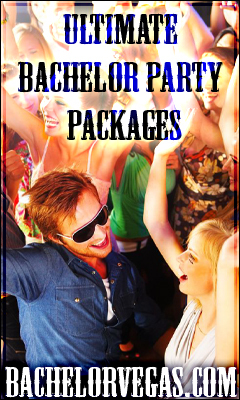 Though The Hangover starts off with the mystery of how the group ended up so oblivious to the night before, your Hangover party package will guarantee that you are well aware of how you completely blacked out an entire night of your life. Much like any offered VIP party package, a hangover package will include your transportation for the night – which is essential seeing as how you’ll be knocking back beer and liquor from the second the party starts. 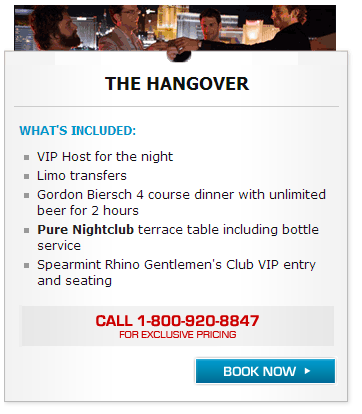 Typical party packages come with VIP hosted entry to a premium nightclub, and the hangover package is no exception. Cover charges and waiting in lines are a thing of the past during your hangover party; and to top off the celebrity treatment, your VIP seating will be accompanied with the club’s premium bottle service. During the first leg of your night, you may be tempted to go all out and reach a blackout point before the fun starts to pick up (and with the amount of alcohol you’ll have access to, it’ll be an easy thing to accomplish). If you happen to survive the first leg of the night without toppling over, chances are things will get far crazier. At some point during the movie, the foursome, in all of their drunken stupor, broke into Mike Tyson’s estate and stole his white tiger. Now, in reading this you may immediately say to yourself “That’d never happen to me”, but Sin City has its name for a reason – and events similar to that are part of that reason. While you may not find yourself stealing a celebrity’s prized animal, don’t be surprised if you wake up the next morning with an unexpected ring on your finger. Drunken marriages are almost a pastime in Las Vegas, and you’d be foolish to think you’re immune to irresponsible, drunken acts. The fact of the matter is if you wake up in the morning with a tiger in your bathroom and no recollection as to why you’re missing a tooth, the night went stupendously. When you’re in Las Vegas to party, the only thing that matters is that you have fun doing it. Just make sure to have a designated camera man so you can have some form of memory of this amazing night out and remember – What happens in Vegas, stays in Vegas.